FreeSkating or Freestyle, as it is something known, is the most popular and probably the best-known form of figure skating. Freestyle skating incorporates all of the technical aspects in conjunction with artistic content and various numbers of jumps and spins skated to a specified length of music. Moves in the Field Tests are a pre-requisite to testing the corresponding Freestyle Test. * Pre-Preliminary - Specific elements required, please refer to the USFS Rule book. * Preliminary - 1 1/2 minutes to music of the skater's choice. * Pre-Juvenile - 2 minutes to music of the skater's choice. * Juvenile - 2 minutes to music of the skater's choice. * Intermediate - 2 1/2 minutes to music of the skater's choice. * Novice - 3 minutes to music of the skater's choice. * Junior - Ladies - 3 1/2 minutes to music of the skater's choice. * Junior - Men - 4 minutes to music of the skater's choice. * Senior - Lades - 4 minutes to music of the skater's choice. * Senior - Men - 4 1/2 minutes to music of the skater's choice. Ice dancing is fundamentally a skating version of International Ballroom Dancing and like ballroom dancing consists of certain individual dances and exhibition dancing. 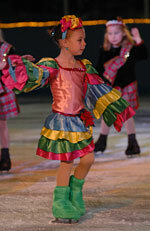 The most common dances are the compulsory dances that are skated in a pre-determined pattern over the ice surface. Dances can be tested either solo or with a partner depending on the testing track the skater has chosen. For specific information on Ice Dance requirements, please refer to the USFS Rule book. Moves in the Field teach the skater the basic knowledge of steps, edges, and form; progressing through the level to Senior, where the skater must display power, extension, strong edge control and precise footwork. A skater must pass the corresponding level of Moves in the Field before he/she is eligible to take the Free Skating Test. However, the skater can advance to one or more higher Moves in the Field levels without taking the corresponding Free Skating Test. Silver Stars - Open to any skater on Badge 7 & 8, Freestyle 1 & 2. This team will be registered as a beginner level team. Shooting Stars - The team will earn the Learn to Skate Synchro 1-4 Badges and learn the fundamental skills of synchronized skating in a group lesson setting. Eligibility: Open to any Learn to Skate skater who has passed at least Badge 2.